Take a seat and a glide in this comforting gliding rocker chair. A deeply tufted back provides you with comfortable support and the ultimate in relaxation. The soothing motion of the gliding base puts your body and mind at ease and is sure to help you let go of stress. 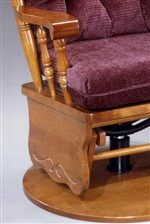 Turned spindles and an exposed wood arm create a classic look that is casual and relaxed, while a carved detail on the base adds a touch of charm to this glide rocker. Available in two beautiful wood finishes and over seven hundred fabric choices, this gliding chair can be customized to create a look that is truly unique that you are sure to love. 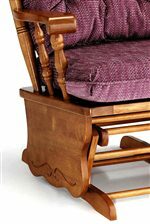 The Jive Gliding Rocker by Best Home Furnishings at Best Home Furnishings in the St. Louis, Chesterfield, St. Charles, MO & Waterloo, Belleville, Edwardsville, IL area. Product availability may vary. Contact us for the most current availability on this product.